Recently the crew traveled to Coto de Caza for what appeared to be a routine deck repair and deck waterproofing. 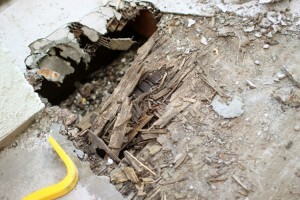 When they arrived dry rot was detected through on-site reassessment. Not a problem for the Prestige team! The supervisor quickly communicated the potential deck hazard to the homeowner, and gave a clear and thoroughly explained recommendation. This is one of Prestige’s “trust values”: highest quality craftsmanship in the customer’s best interest. The team quickly and thoroughly determined the extent of the water damage and began the repair. The homeowner was relieved that we were able detect this before starting the job, which would have left him very few options. After discarding the problem section of all weakened material, the team analyzed the fastest and most beneficial way to lay a sturdy foundation, and began to deck reconstruction, down to the studs. To insure a solid base for making the plywood flush, the team double reinforced the 2 X 12 beams with fresh timber. This was then leveled with the existing structure in preparation for the plywood sheathing. Using only the finest industry standard materials, exterior grade 3/4 plywood was custom fitted, cut on site, and double reinforced. This is just one of the ways that Prestige makes the deck repair look seamless. Two new deck drains were also installed. 5-layer system. With the sturdy base in place, this repair felt like a real accomplishment. The team then proceeded to install Prestige’s trademark 5 year warranty, 5-layer deck restoration system: 2.5 lb. diamond shaped galvanized metal lathe installed with at least 24 staples per square foot, followed by our polymer modified concrete, then laminated using fiberglass matting and acrylic resin, overlaid with another sealant layer of concrete, then sprayed with a concrete texturing, masterfully completed with the custom Prestige color paint of your choice. Deck waterproofing at its finest! This customer wouldn’t have to worry about overflow or pooling during flash flooding season. This customer got more than they paid for on this repair: personal care, going the extra yard, and an aesthetically pleasing final product that is assuredly water tight. Prestige Deck Coating is Orange County’s choice for deck repair, restoration, and waterproofing!